Click here for VTC newsletter (May 2018). Click here for VTC newsletter (Oct 2018). Carefirst Vocational Training Centre recognizes that Personal Support Workers are valuable members of the health care profession. Their contribution increases individual capacity for independent living in both community and institutional settings. Our aim is to educate all our students regarding quality care for clients of all ages, as well as to maintain productive relationships with our service partners and service providers. The approved redesigned training curriculum, with 650 hours, was rolled out in 2016 Fall Semester. The new program prepares graduates to provide care to individuals with complex care needs. With the high quality of the Carefirst PSW training, many graduates are employed soon after graduation. There is a myth that PSWs have a final Ontario Exam, or more commonly, have been told by National Association of Career Colleges that the NACC exam is the provincial exam. The Personal Support Education Accreditation Programme (PEPA) has received several complaints with regards to a PSW’s entry to practice. Many of these issues have centred on a belief that Ontario has a “provincial PSW exam” that graduates must pass before they are eligible for employment. While there are restrictions on the standards to which a school must teach, Ontario does NOT require graduates to complete a provincial examination prior to working as a PSW. These four educational institutes must adhere to minimum programme length and to one of 3 sets of standards if their graduates are to be eligible for employment as a PSW in long-term care home. Note that the province does not mandate any “end of programme” examination for graduates. Schools using the National Association of Career Colleges curriculum have the option of writing an end of programme exam. This examination is NOT a provincial requirement for employment, nor should it be considered a replacement for a PSW’s successful completion of a PSW programme. Similarly, completion of any end of programme examination is not a requirement for inclusion on the PSW Registry. The PSW’s successful completion of an approved PSW programme is the employer’s assurance of eligibility for employment. Community Enhancement Program – Linguistically accessible curriculums continued to be delivered to the Chinese population. Carefirst’s community enhancement courses bring culturally relevant knowledge to the Chinese community, enhancing their individual and community capacity. 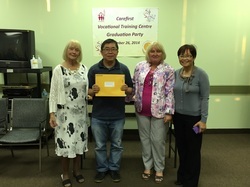 The Care Attendant Training for Post-Natal services is one of the highly demanded programs in the community. Future Development – To meet the community service sector needs for more frontline ualified and well trained personnel to support the increasing service needs, Carefirst VTC is working on to expanding the training programs to meet the needs of the community. Click here for Food Handler Certification course. Click here for Enhancement in English course. 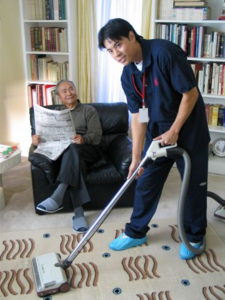 Click here for Home Helper Training.